Hurricane IRMA moved across western, north-western counties of Florida and south-western Georgia on 11 September, weakening into a tropical depression. Over the next 48 hours, it is forecast to pass over Alabama and western Tennessee. Heavy rain and strong winds could affect these areas. Media have reported ten deaths across the United States. As of 12 September, damage and needs assessments are ongoing in the affected countries. 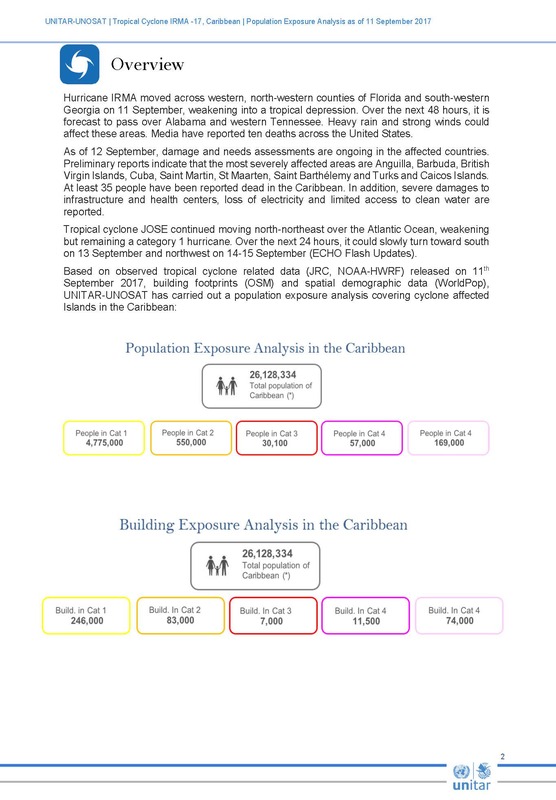 Preliminary reports indicate that the most severely affected areas are Anguilla, Barbuda, British Virgin Islands, Cuba, Saint Martin, St Maarten, Saint Barthélemy and Turks and Caicos Islands. At least 35 people have been reported dead in the Caribbean. In addition, severe damages to infrastructure and health centers, loss of electricity and limited access to clean water are reported. Tropical cyclone JOSE continued moving north-northeast over the Atlantic Ocean, weakening but remaining a category 1 hurricane. Over the next 24 hours, it could slowly turn toward south on 13 September and northwest on 14-15 September (ECHO Flash Updates). Based on observed tropical cyclone related data (JRC, NOAA-HWRF) released on 11th September 2017, building footprints (OSM) and spatial demographic data (WorldPop), UNITAR-UNOSAT has carried out a population exposure analysis covering cyclone affected Islands in the Caribbean.